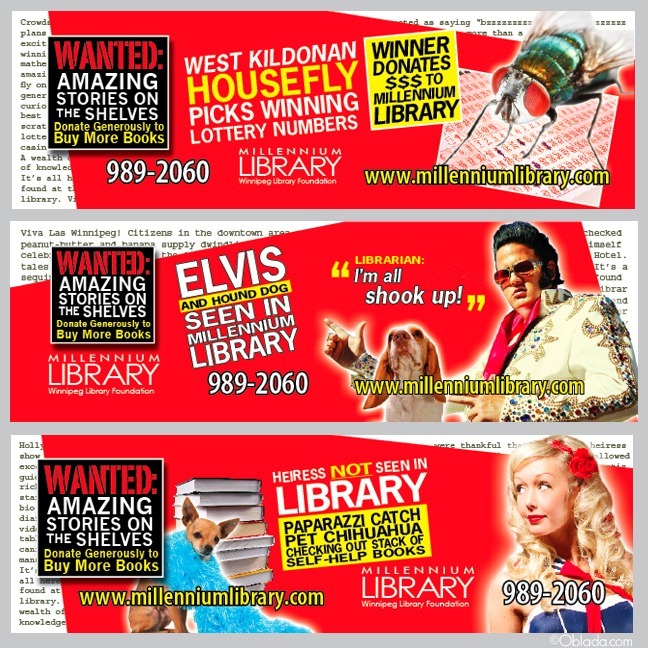 Then there's this campaign for Winnipeg's Millennium Library (circa 2007) that was developed in collaboration with Peter Skakum and Carol Marshall of Tangent Strategies. It included transit advertising, direct-mail, brochures and more with the sole intent of generating financial donations in order to buy more books to fill the shelves with new worlds of imagination. We had a lot of fun creating this (but it also helped to have a client that was completely open to anything). The campaign was so popular that an auction was held for the in-branch banners that were located at all #YWG library branches. My favorite of the seven-part series was always the Paris Hilton heiress one. It's like a timecapsule of 2007. I still like the concept (would tweak aspects of the design if redoing today) and it's one of my favorite portfolio pieces.